2014 Pumpkin Patch Was a Success! What an awesome pumpkin patch we had this year! 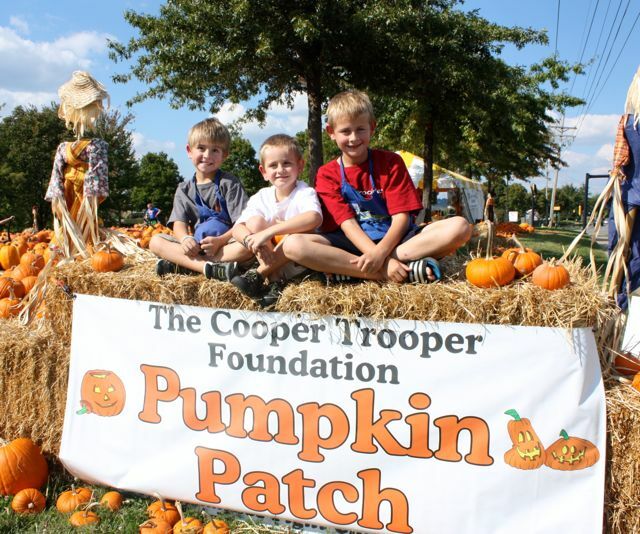 We sold more pumpkins than ever before, and raised over $53,000 for Cooper Trooper! So, thank you to all of the sponsors who support us financially, so that every dollar raised can go straight into the foundation. Thank you, also, to the amazing volunteers, the teams and groups who come out to unload thousands of pumpkins, David Crabtree for our prime location, Santa’s Trees for lights and steps this year, Walgreens for their continued support and use of the parking lot, Novo Nordisk for bringing a clean up crew, Go Minis for the storage pod, Nashville Tent, the “A” team crew for filling in the gaps and always being willing to help in any capacity, and for our customers who came out for the first time and those who continue to come back and spread the word for us! We couldn’t pull it off without YOU! So, thank you for continuing to support “Pumpkins for a Purpose.” You make a difference in the lives of families impacted by childhood cancer, because of your support of CTF and the Pumpkin Patch. Hard to believe, but it’s time to start gearing up for our 2014 pumpkin patch! We have already been working on details for this year’s Cooper Trooper Pumpkin Patch. There are new opportunities for sponsors, such as an exclusive day at the patch for your company for our platinum sponsors. Another new addition this year will be family weekends every weekend that the patch is open, complete with fun family activities such as face painting and a bounce house. We already have several sponsors, who have jumped on this opportunity to support a local charity in the community, while gaining prime marketing exposure. Our deadline this year is JULY 1st, so don’t delay. Go HERE to complete a submission form. It’s hard to believe we are only 7 days away from Halloween and the closing of the 2013 patch. It has already been hugely successful, beyond what we could have hoped for. We have sold LOTS of pumpkins already, but most importantly, we have met lots of new faces that we were able to tell about the mission of The Cooper Trooper Foundation. To say it has been difficult without Rod’s presence this year, is beyond an understatement. His passion and excitement for the pumpkin patch each year, left a mark on all those involved. That is the very reason we press on. That is why we are more motivated than ever to make others aware. The impact of childhood cancer on families is real. It is harsh. It is life altering. Sadly, the lack of funding and support it receives from the government pales in comparison to other cancers. Unfortunately, siblings are “lost” in the shuffle, with little support. That is WHY we exist. We will make a difference…one dollar toward research, one sibling encouraged, and one family empowered. ONE at a time! If you are in the area, come see us this weekend. It is sure to be hopping! The Cooper Trooper Foundation thanks everyone who has supported us this year. Now let’s go carve some pumpkins and make some pies! A HUGE “Thank You” to so many who supported our 3rd Annual Pumpkin Patch! We are thrilled to announce that the Foundation raised almost $40,000 between pumpkin sales, sponsorships, and donations during the month of October!